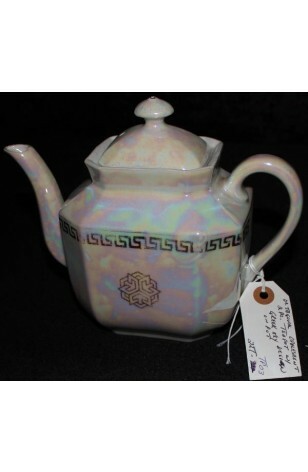 Antique - Opalescent Lustreware, with Greek Key Pattern Teapot with Lid, Made from 1850's to 1890's. This is a Beautiful Opalescent Lustreware Teapot and Lid, simulating "Mother of Pearl. It is Decorated with a Greek Key Pattern and Stylized Flower. The Teapot is in the Shape of a Hexagon with a Small Rectangular Foot and Rectangular Rim and Lid. This Teapot is in Great Condition, well cared for over the years. Does not even show signs of wear. This is a Beautiful Opalescent Lustreware Teapot and Lid, simulating "Mother of Pearl. It is Decorated with a Greek Key Pattern and Stylized Flower. The Teapot is in the Shape of a Hexagon with a Small Rectangular Foot and Rectangular Rim and Lid. This Teapot is in Very Good Resale Condition unless noted below or in pictures. Well cared for over the years. Does not even show signs of wear.